2007 has come and almost gone - so fast - so much achieved and so much to be done. Here are some more applique on net samples.This first one is similar to yesterday's but I have added some cord to the net. This one has some Honesty from NZ minus the seeds thanks to Aust quarantine who helped me take them all out after one trip. I have been waiting to use some of the plants. It's very transparent. They look like eyes but really they should be seen as petals if I am to be true to my theme. 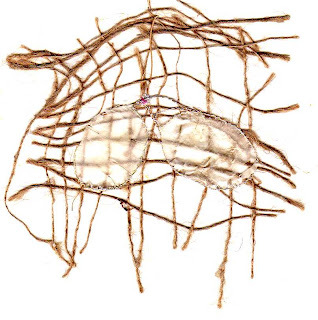 Apart from this one and the first one on black net, all the other nets I have made in some way. I have a few more in the pipeline then I shall move onto playing with velvet. 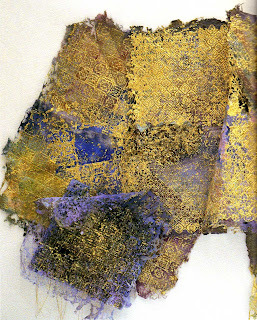 The one below is the last one for 2007 - the applique material is painted Gossamer Fuse on slightly distressed sinimay. Today I went off to Dummies WA to borrow a black dummy for some photographing. It's a scream of a place but they are closing in a week. I don't think there is anyone else who makes them. When I take my dummy back I might be tempted to buy a couple more. I wish you all the very best for 2008 - may you explore outside your comfort zones and grow in your originality. Ian and I are planning a quiet New Year's Eve, eating prawns and scallops and drinking champagne and watching Gormenghast. My new year's resolution is to produce a newsletter at the beginning of each month so if you are on our newsletter list (you can sign up on the website), watch for tomorrow's! I am having fun with my HH stuff today - the weather is not so hot - there's a cyclone up north and we are having some refreshing wind. and another - I will leave you to guess what they might be. 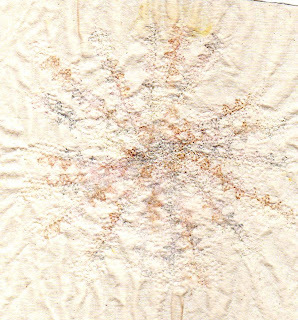 My next applique on net sample - lacey Japanese paper applique my machine did not like - off to experiment some more. and since you all enjoyed our wedding photo, I have moved on into the early 70s - obviously I had a thing about flowers then too as I can see one on my top. Ian is busy playing with our new toy - the Sonos system- and we have our water filter all fitted. Tomorrow is the last day of the year - just where did it go? It got to Friday very quickly but things like Christmas and holidays always causes confusion. The weather has improved for the moment. 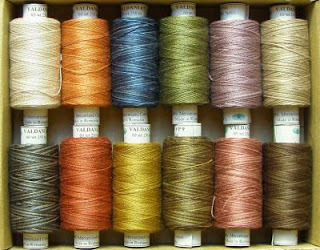 Had a huge order in from valdani threads including this dear little boxed set of 60wt hand dyed cotton thread on cute spools. It's the first time I have ordered any 60wt - I thought I would test the waters and Ian decided to add it to the specials. I got a few other boxed sets in 35 wt and in the pearls as well. 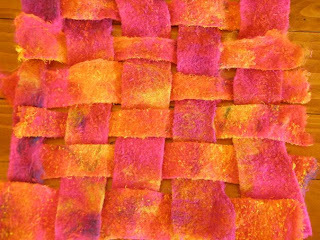 I have been doing some preparation for my 2 day Embellisher class in Melbourne at the Embroiderers' Guild Summer School in January - playing on some lovely bright scrim and cutting and weaving - it is waiting for machine wrapped cords to feed through probably with some flower stitch thingies as well. 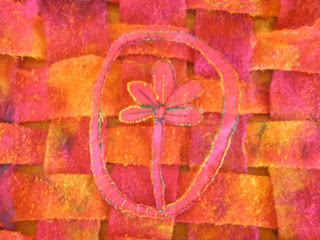 On top I have laid my first HH sample of net applique - seem to have found these flowers again. Heaven forbid. Tonight we are having Raan - Indian leg of lamb - sounds silly after lamb at Christmas but the butcher for some unknown reason, gave us 2 legs of lamb with bone when I ordered 1 boned and stuffed leg of lamb so I thought I have better marinade it - rubbed spices all over and coated it with yoghurt, nuts and saffron and drizzled honey over the top. The hoover machines are coming around tonight to help us eat it. What have we listened to today? BBC Classic FM, Radio Montreal and Radio IO Classics and Tom Waits. Oh and Nelsa is home from hospital and has a low white cell count which is really good. She'll be able to start her chemo soon. slowly getting back to normal? Well, it wasn't the hottest days since 1915, it was the hottest days on record. Today is much better although putting the air con on early means it's okay indoors, but the sea breeze (aka the Fremantle Doctor) has arrived this afternoon so hopefully the hot weather is moving off to the Eastern States. Our new Sonos system is keeping us both very busy indeed. I have loaded 6000 songs (tunes) into I-tunes and then onto the system. We can queue up music and over-ride each other's choices until the bridge for the studio arrives and then we can choose our own lists. So we are listening to tracks we haven't heard for ages and have loaded in all these interesting radio stations like UK Classic FM, Martha's Vineyard Radio and Radio Montreal. Keeping us both heavily out of mischief. Yesterday the boys came over and hoovered through the fridge leaving us the left over roast vegetables only. Kazuko came after work and finished off what was left. I have started working on velvet on black net for HH - playing with my lace designs. The heat and Christmas sort of slow you down but hopefully we'll be back on track soon. Not to mention all the time spent loading cds onto the poor computer which has been working overtime. 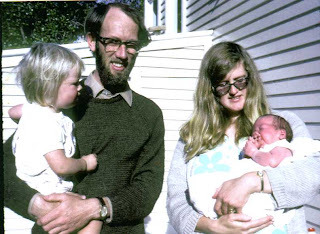 We went to visit Max and Nelsa when we were in NZ - in Reefton - Nelsa is in hospital until tomorrow so fingers crossed that all is well and hope that Max has been behaving himself while she is away. It was lovely to see them both. You need to catch up with people. We all got lots of lovely goodies and Ian and I were very indulged by Grant who gave us a Sonos system so I can have music in the studio and Ian can listen to his own choice in the house. Most of my time today has been loading our cds into the system with many more to go in the next few days. Then we have had to learn how to use it! Kazuko and Bruce gave us a water filter which is also super since we have decided we should be drinking lots of water and I don't like Perth's tap water very much. The old stereo system has been moved out and I can hear all sorts of discussion about speakers, plasma tvs, furniture etc. Today we have stayed indoors - Ian got a new hand lawn mower which he went out to test on the front lawn but only lasted a short while. Then we have discovered it got to over 44 degrees today with not a great deal of relief for the next week. Think we might go swimming tomorrow but you need to go before its hot or it defeats the purpose! To prove I did a workshop. Forgot the digital and Ian arrived back a bit late for photos of all the lovely work. Jenny very kindly loaned me her Bernina to use. I am trying to get it all back together for her. I always have trouble fitting the tool box back. 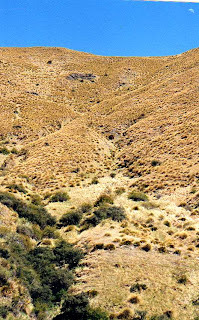 This is Okarito on the West Coast of NZ, South Island. The home of the White Herons not that we saw them but it is a sanctuary and other birds are protected there. Just a little place but it would be a great place to chill out for a few days. 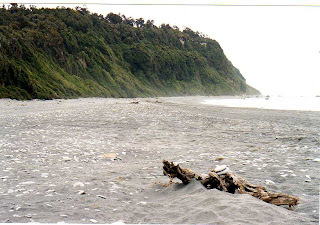 I like the West Coast beaches - not all bright blue and welcoming for swimming and sunbathing like the Aus ones but what I grew up with - mine is in the North Island and was often grey but somewhere we enjoyed going to very much. 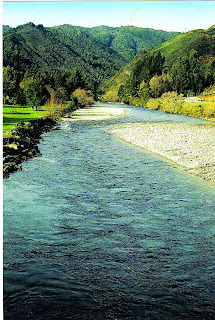 On the other side (it's an inlet) Ian got chatting to a guy coming in in his boat and he suggested the best time to visit was in the winter when the snow is on the Southern Alps - all wrapped up and with plenty of books to read. I have been playing around with my header - Blogger must have changed the formula as i lost half of it so I wasted several hours getting sorted. I have now got a different one on each blog - sort of keeps you busy. 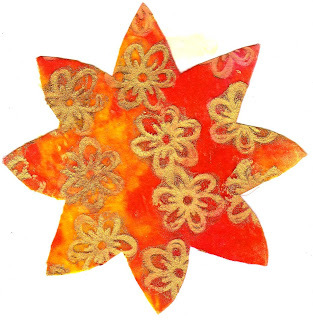 No 3 is from Carmel Leitmanis - glass plate printing which is such fun to do. Tomorrow I will post some Module 2 work. We are still sending out orders - last drop for Express Post tomorrow night to be delivered on Monday probably before I have my Christmas shopping finished. I must say that a parcel of books was sent from UK to us here on Tuesday and it arrived this afternoon - now that IS service. Finally there is a Neoworx Flag quiz for you to do - scroll down below the visitors thingy. I am not doing very well with titles for my blogs but never mind. This morning we spent cleaning up Grant's house - all the rubbish the squatters left behind. We meant to take the camera but forgot. Not actually touching anything. Somehow it's not so bad when you don't have to do these things on your own - you can talk away about the situation. Opened the windows to air the place. We filled 2 big rubbish bins. Anyway, it's all ready now for the knocking down of the burnt out back and the starting of the rebuilding. The architect and Grant have done a great job and it will be wonderful when it is finished. We were still pretty busy with orders today but it will start slowing down now - the Express Post bags are out in serious activity mode at present. 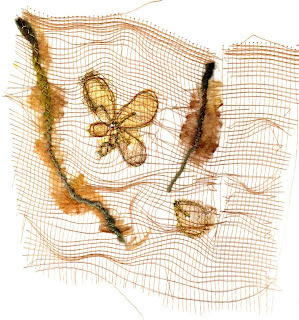 I am trying to plan a project which I need to finish next week to get it away and I am dithering with ideas which will need to transfer into objects very quickly. This is the lacey hydrangea which tried its hardest to die when we were in the northern hemisphere - it is flowering beautifully and was worth the effort. Val and Jim have given me a couple of other small ones but this is the only special one. Next year I need to note in my diary that I must blue it at the right time. I always leave it too late. I have finally set the christmas tree up in the studio after it fell over about 5 times in the lounge and the branches fell off etc. Ian says some of the decorations I bought last year are too heavy. It didn't fall over last year! Just need to find a cord so the lights can sparkle. Kazuko will be happy when she gets back as she will be able to put her presents underneath it. I am afraid we still have to buy ours. I went into town this afternoon but there were too many people so my progress was very slow indeed. 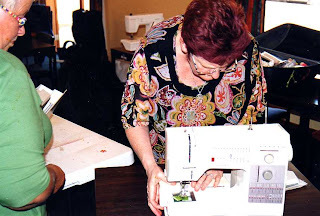 Barbara - you asked if the flower stitch foot would fit the Designer 11 -I asked David at Husqvarna and he said if it fits my SE it will fit it. You need to unscrew the little thing on your shank - mine is white but yours may be black, and the foot fits on. It doesn't like the Orchidea and wouldn't work properly but I think the SE is a lot more stable. There were a few things which annoyed me about the Orchidea although it sews beautifully. I have mine here for sale if anyone is interested. I know I won't use it - how many machines can one use? Also you asked about the article. 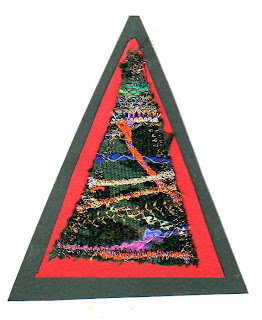 It will be in the Australian Machine Embroidery and Textile Art magaine (those last 2 words are a bit of a joke) due out in January. I have a copy of the article here somewhere which Yvonne sent me to check. 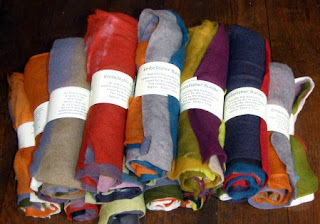 You would have bought threads at Ally Pally - I am so pleased you are enjoying using them. A customer asked me today how the flower stitch foot fitted the Designer SE so I fitted it to show her and then later on I thought I would have a play. Well, of course, all these extra stitches can come into play. 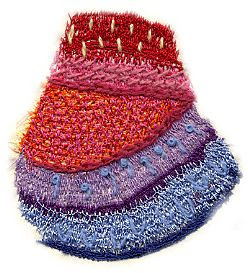 This sample is of some of the decorative stitches I played with at various widths. The world is your oyster.... and your imagination as to how you utitlise them. Grant arrived back today and we had a pleasant evening - bbq in between the rain. Is it unseasonable or does it happen most years at this time? Bruce and Kazuko tell me it has been raining down in Walpole but when we went camping down there in about 1979 it was freezing and wet. We have had a nice relaxing weekend in that I have collected up all the orders which have come in since Friday afternoon and Ian has finished getting the specials up - nothing like being late once again..... We went to Elizabeth - The Golden Age on Sat afternoon - the story is limited - really about the Spanish Armada but we loved the photography and the costumes and Cate Blanchett so of course it was worth it! 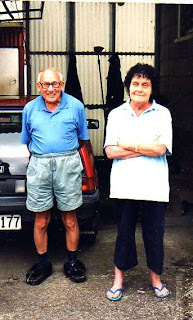 Then we snuck off to Luigi and Martien's so Ian could have spaghetti bolonaise (that's his favourite Italian dish) - Bruce and Kazuko have gone to Walpole for a few days so hope they are not getting too wet. The weather is cooler which makes me happy but looks like it will hot up again for the weekend coming. Grant arrives tomorrow so hopefully the squatters have gone - lots of cleaning up of syringes and stuff though. Grant and his builder start work on Tuesday. I have spent most of my time sorting out my HH stuff - nothing serious to show but I have been making little sketches and thinking about what I might do for decent samples. When I was out walking this afternoon I saw some fabulous interestign dummies in a shop window which gave me a very good idea - had to make my notes on the back of my tiny shopping list. 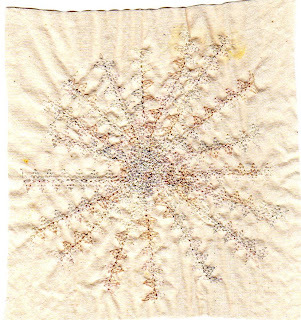 I have litle stitched samples undergoing a variety of distressing activites - not rusting yet. We went out for a dim sum lunch with Eva and Malachy - very nice outing. Our street is still quiet but it looks like the works have finished so the traffic will be back once they open it up again - shame. I have just realised that it is one year since I started the neocounter and I have had just over 88,000 visitors to my blog - amazing! 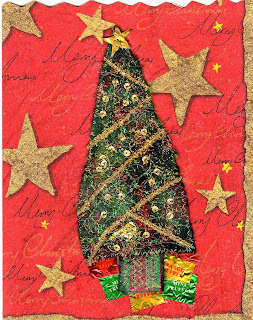 Talking of Christmas cards - Anna sent me a lovely one - thank you. 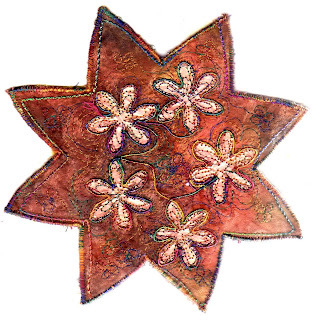 I shall try to make at least one on the embellisher. 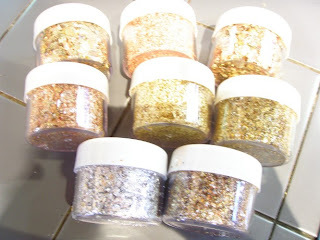 For HH, I have a variety of samples in various places and stages so I really feel I am underway at last. 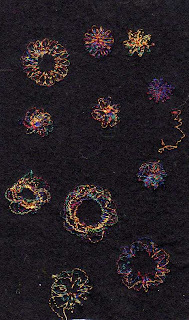 I have bought a number of early machine embroidery books from Alibris and have been reading Dorothy Benson - written in 1952 but still very interesting. Nothing is really new under the sun. 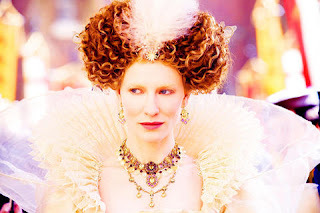 Tonight we are off to see Elizabeth, the new film with Cate Blanchett in it. This is the first opportunity we have had to see it so I am looking forward to it. I have caught up with all the orders and I think we should have them all posted out tomorrow and more specials are appearing on the web each time Ian spots a space in time. I have finally made a decent start on my HH (Historical Heirlooms) course. I am focusing on the Elizabethan period and in particular collars and cuffs - the lace. 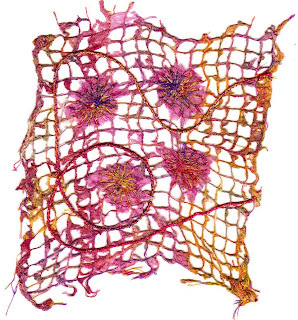 If you visit Anna's site - Serendipity - you will be able to see some of her wonderful samples. It's a shame I can't go for real but I shall plod on on my own. I have decided to stitch on calico (this is real recycled stuff - from 12 years of being on tables at the shows and I decided I could easily rest one tablecloth). They are certainly well handled and grubby and some have foodstains/blood/things people spill etc. Highly appropriate. I am stitching with Vanilla Beans rayon because I want to stitch with colours close to the lace but worn and aged. 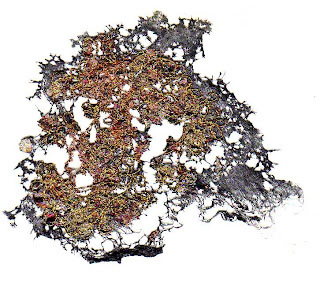 This is my first sample and I won't be distressing it further - I need to keep a first one I reckon - for reference. 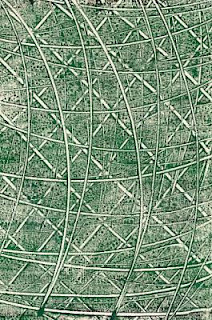 This next one which doesn't show so well, I have distressed as much as I can using the embllisher. It's off for the coffee or tea next. One I have buried in the garden near Luigi's grape vine for a few days or so. I picked up the video of Gormenghast last night from Planet Video but didn't get to watch as we went to Bruce and Kazuko's for a bbq and to watch the Barbarians play the Springbox. I think that all games should be like this - full of professionals enjoying themselves - rather than country angst - Nonu played the best I have seen him. The squatters in Grant's house have been an unwelcome extra to this week. Hopefully they will soon (or even now) be gone - Grant starts work next week after he gets back. I have even had time to do a heap of packaging so definitely on track again. 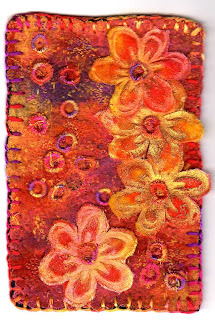 I made up all of these embellisher bundles - you can also see them on my embellisher blog. They were very popular in London and I have only just got another pile in. 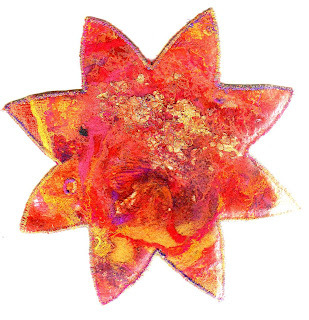 The embellisher loves them - very fine and you can layer the colours and work back through. We are so busy it is crazy. If you have ordered and are anxiously waiting your goodies, they are on their way. I don't think we have ever been so busy but it must be punishment for going off to NZ! I have been making my goodie bags (for every order over $50 this month) continuously it would seem. And Ian is slowly adding the specials as well. He has a huge queue of orders which are going down but in the morning I will add to it. We will be working right though to Christmas Day. We had some drama this morning - there are squatters in Grant's house - the one which had the fire and Grant has been waiting for council approval for his building which starts next week - he gets back here on Sunday. I went round to empty the letter box and peeped in one of the windows and there was a very unkempt person asleep. The police apparently are off to collect them tonight and we have been told to keep away! Back to NZ - the photos haven't even been to the developer but Gilbert van Reenen has very kindly let me 'steal' one of his photos - this one is of Wanaka where my workshops were. It is such fabulous country and if you want to see more wonderful photos go visit Gilbert's website. He is husband of Robyn - half of Christofer Robyn (other half is Chris) who organised the workshop. We have one of his books and he very kindly gave us the other one. I have enrolled in the Historical Heirlooms course and while I haven't completed a great deal yet I have been doing a lot of research. So watch this space and I know Janet reads my blog to keep an eye on me I think. 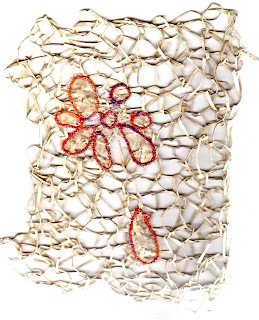 I have been drawing and making notes and a little stitching so far. 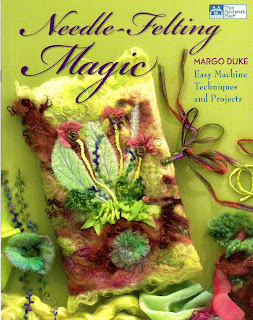 I have also been collecting a few out of print early machine embroidery books which make fine reading I must say. 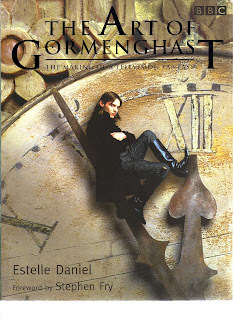 But my special book which has just arrived is The Art of Gormenghast - Kirry Toose told me all about it and Planet Video has just informed me the video is up there for me to borrow. The book is all about the making and the section on the costumes is fascinating. All to be part of my reseach as well. I must hunt for the book to read as well. We are back after a lovely week in New Zealand. We forgot to take the digital camera so I will have to wait for Ian to have his photos developed. 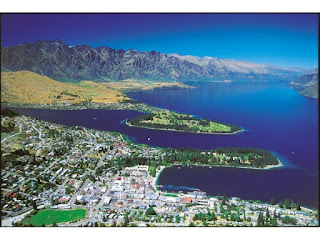 In the meantime, here is Queenstown and the beautiful Lake Wakatipu. We flew to Auckland/Christchurch/Queenstown and went to dinner at Wai on the edge of the lake watching the Earnslaw pull out - many years ago I went on the Earnslaw up the lake. We had a lovely meal indeed and many more to come. We stayed at The Milestone B and B where Betty and John are the most fabulous hosts. Betty is also a marriage celebrant and on the Sunday Ian helped with the bbq cooking -right up his alley. They have a wonderful garden. 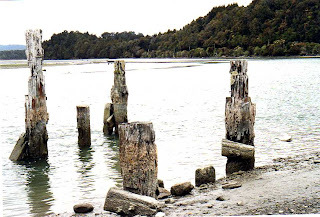 My workshop in Wanaka I thought went very well (I hope) and there was some fabulous work done. Robyn and Chris hosted a lovely bbq at night for all of us. Very much appreciated. We arrived back last night and today I have spent all day gathering up the supplies for all of the orders - well almost all and Ian has been glued to his computer as well. If you are waiting for the specials they will be up tomorrow and worth the wait for sure. I have only just got to the studio at 6pm - to put things away. 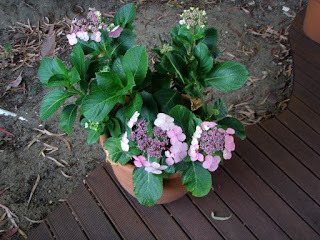 I am pleased to report that my hydrangeas are very much alive - one is a lacey one and it is just coming into flower. Thanks to everyone for all of your lovely wishes - may we all stay healthy, happy and busy! 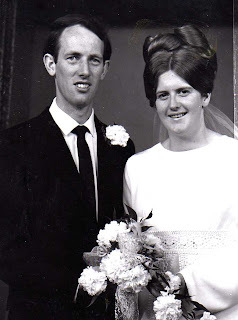 tomorrow is our wedding anniversary - not as many as the royals but tonking along. This is us many years ago - just think I was only 19! And that hair is all mine. Ian's is all his too.... We have a table waiting for us in Queenstown tomorrow night if I ever get packed. I have just finished all the orders and sent out the newsletter with only 2 spelling mistakes - thanks Doreen! . 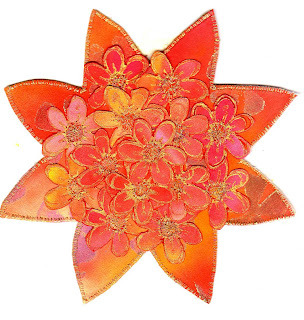 Here is the last flower to back the embossed velvet one. I used all the scraps from the last 2 postcards. There is a water paper cast somewhere hidden in there. Back in a week. We are flying to Christchurch, then Queenstown. 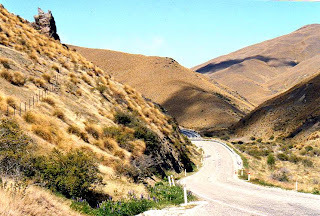 Teaching in Wanaka 2 days (while Ian is roaming the countryside or the vineyards) then up the West Coast to Fox Glacier for a night, then to Reefton - Ian's home town - to see Max and Nelsa and Aunty Shirley, then over the Lewis Pass to Hamner Springs for a swim and back to Christchurch. I have been up for a long time today - think I first got up at 4am which was a bit early even though I had plenty to do. 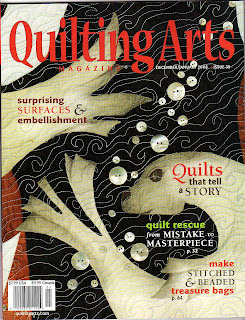 The latest Quilting Arts finally arrived having been in Customs for a week - if only the correct documents would come with the shipment it would make all of our lives easier. Here's hoping for the next issue. But we worked very hard and got them all out by the end of the day. 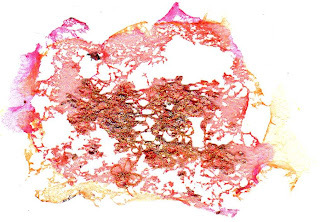 There is a lovely article from Sara Lechner whose work I have always admired. 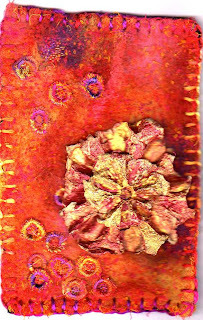 Here is today's flower postcard - not quite finished as it needs some hand stitching - yesterday's has gone to new pastures. They are both similar - embellished background using 3 different colours of scrim which Rae has just sent me all brightly dyed as per my special request and the tiny flowers are using the flower stitcher (of course...) Yesterday's had embellished velvet flowers - today's has a water soluble paper flower. Last night Bruce took seemingly 100s of photos of the studio (and even some with me in them which he and Ian thought were up to their usual awful standard. The upshot is that I have a superbly tidy studio but one still has lots of work in progress and lots of inspiring things to see. Today I held the slats for the fence so Ian could nail them back onto the fence and it looks like they never fell off although there is lots of tree debris in the garden and I have to face the fact that other branches have to be chopped down. Wow - this is the first time I have loaded a picture which won't blow up when you click on it - I have even scanned it twice and reloaded it. Must be meant to remain small. Bit of excitement this morning - a very large and heavy branch fell down from one of the eucalyptus trees and broke the new fence between us and next door. Lots of sawing up of branches and slats to repair! 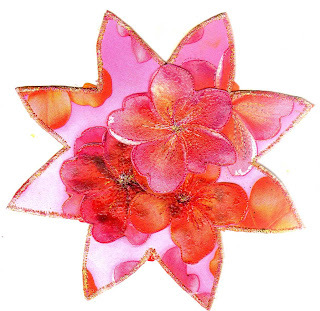 Here is my today's flower postcard - it has changed shape back to more conventional. Many photos later and a nice tidy organised studio. Maybe I should do this a couple of times a year. No local takers for my freebies at the front door. 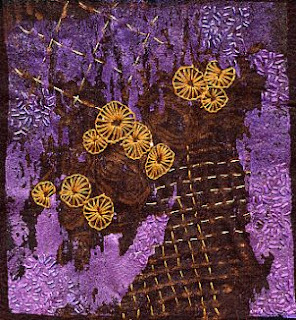 This is one of today's flowers - embossed velvet - I will stitch it tomorrow and join it to whatever is going to be on the other side. And of course, Joan, you can see them! I am just trying to gather my ideas and techniques into one place. 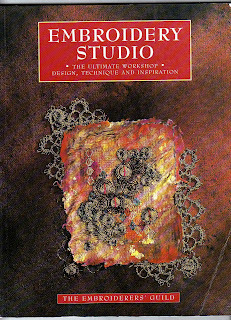 Today a copy of Embroidery Studio arrived from Amazon. I have had a copy for a long long time but I haven't been able to find it anywhere and I am sure I haven't loaned it out. Maggie told me it was very expensive on Amazon etc now but I managed to obtain a copy for a good price. I am sure mine will turn up and then I will sell this copy for what I paid for it. It has been a particularly valuable source book for a long time - Val C-H has 2 contributions and she has signed my original so that is why I am still searching. 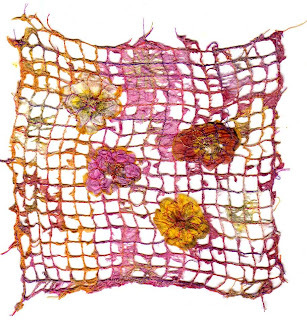 As a book, each contributor looked at a piece from the Embroiderers Guild collection and intrepreted it in her own way. One of my favourite pages of 2 is Jean Mould's page below. It was my intro to hand made paper and I used to spend ages staring at these two pages. The scan doesn't do justice to the work. As an inspiration for ideas rather than projects or copying stuff, it is superb. On our front verandah (as a result of my tidying up), I have a spinning wheel, a trolley thing (very useful for carting stuff to workshops in) an a big bag of spools for winding down onto. They are free but need to be collected by Thursday morning before we go to NZ. I also have a pile of textiley magazines for anyone who wants them. 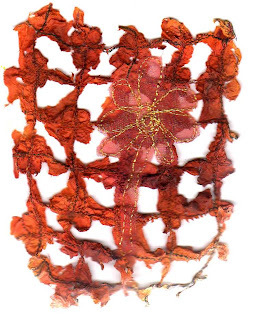 This one is a copper tissue flower card. Have to get up bright and early in the morning to clean up the studio - Bruce is coming to take photos in the afternoon - it's high time for a big sort out! Well we have had our election and the results are in. Just hope we all get what we think we will get. Have to say the speeches from both John and Kevin were dreadful - is this the way of the future? These make great little crunchies and I shall attach them to one postcard. Very hot here and going to continue tomorrow. Hope everyone in Australia remembers to vote. for the first time since we were students, we are actually doing something - working for Get Up in Stirling - in the middle of the day - in the heat - so must remember to take our hats and water bottles. Tonight and tomorrow night we are having a barbecue in the back garden. 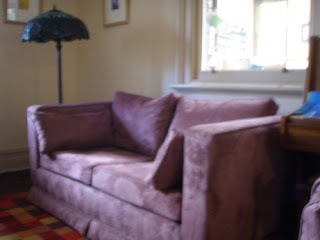 I haven't made it much into the studio as yet this week but should be able to get some work done tomorrow - I need to.... Our sofas have ome back home all newly covered, new springs and looking beautiful. They should last for at least another 15 years. A brave new colour scheme which seems to fit in quite easily. 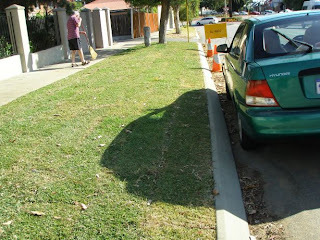 While we were in Melbourne, our new lawn was laid on the verge. If you are a visitor you will know it has been rather bleak for a while but so far it is looking great - Ian is busy sweeping up the leaves. He keeps popping out to see how it is going. 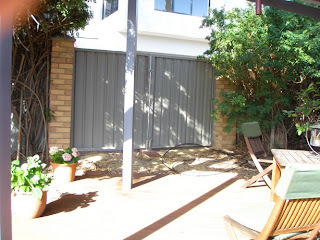 And to make a third thing, these are our new double gates at the back into our right-of-way. The flats etc next door are finally completed and are open for viewing on Saturday - next task for us is to get a sail for the last bit of privacy. 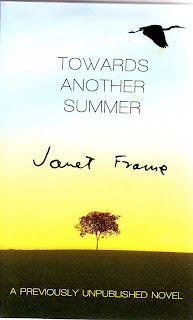 I have just finished reading Janet Frame's posthumous book - Towards Another Summer. She wrote it in 1963 but stipulated that it not be published during her lifetime. It is very personal and a brilliant write. I have been reading Janet Frame for a very long time - my feeling is that she is NZ's greatest writer. I have also added a pic on my embellishment blog of the Merrylock whic Kates Sewing Centre in Melbourne is selling. It's a good value machine which I had use of at Geelong from Jacinta. I should also tell you that we have had lots of other exciting goodies this week - little wooden charms - hands/feet/hearts in petite and grande and little charm faces. Great for adding to your wild women akka Sarah Lawrence style or even your little embellished houses my style.